Plate tectonics, volcanism, landslides, erosion and deposition—and their interactions—are all very evident in this view of the Crater Highlands along the East African Rift in Tanzania. The image shows landforms using color and shading. Color indicates height, with lowest elevations in green and highest elevations in white. Shading shows the slope. The vertical relief has been exaggerated by a factor of 2 to reveal greater detail about the landscape. The image is oriented as though you were looking from the north toward the southwest. 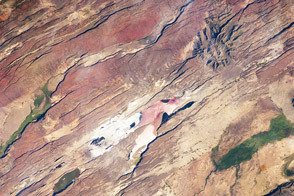 Lake Eyasi is in blue at the top of the image, and a smaller lake occurs in Ngorongoro Crater. Near the image center, elevations peak at 3,648 meters (11,968 feet) at Mount Loolmalasin, which is south of Ela Naibori Crater. 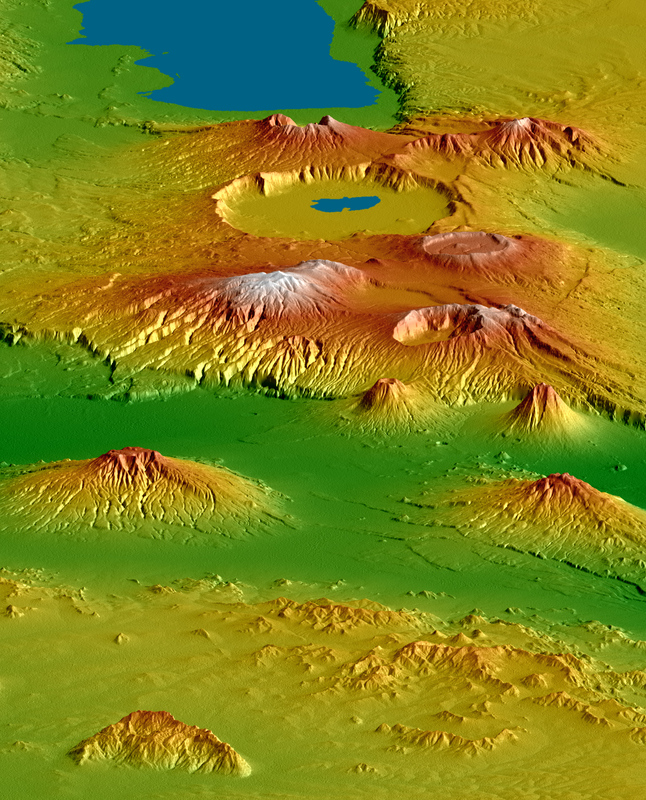 Kitumbeine (left) and Gelai (right) are the two broad mountains rising from the rift lowlands. Mount Longido is seen in the lower left, and the Meto Hills are in the right foreground. The East African Rift is a zone of spreading between the African (on the west) and Somali (on the east) crustal plates. Two branches of the rift intersect here in Tanzania, resulting in distinctive and prominent landforms. One branch trends nearly parallel to this southwesterly view and includes Lake Eyasi and the very wide Ngorongoro Crater. The other branch is well defined by the lowlands that trend left to right across the image (below center, in green). Volcanoes are often associated with spreading zones where magma, rising to fill the gaps, reaches the surface and builds cones. Craters form if a volcano explodes or collapses. Later spreading can fracture the volcanoes, which is especially evident on Kitumbeine and Gelai Mountains (left and right, respectively, lower center). The Crater Highlands rise far above the adjacent savannas, capture moisture from passing air masses, and host rain forests. Over time, streams erode downward toward the level of the adjacent rift, deeply dissecting the volcanic slopes. This is especially evident on the eastern flanks of Mount Loolmalasin (left of center). Landslides also occur here. In particular, the small but steep volcanic cone nearest the image center has a landslide scar on its eastern (left) flank, and topographic evidence shows that the associated landslide deposits extend eastward 10 kilometers (6 miles) across the floor of the rift. Such a long run of landslide debris is unusual but not unique on Earth.